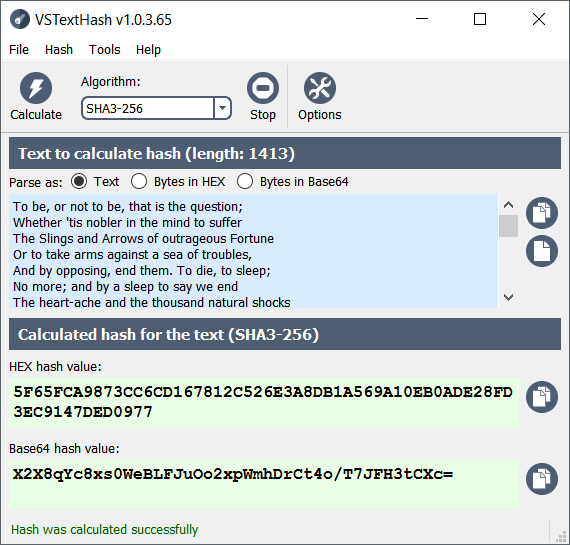 VSTextHash is a cryptographic hash calculation software. This software lets you hash text with many different hash algorithms. VSTextHash is a cryptographic hash calculation software. This software lets you hash text with many different hash algorithms. Simply type the text in this calculator and hash string for entered text will be immediately displayed. VSTextHash supports a variety of cryptographic hash functions, including SHA1, SHA-224, SHA-256, SHA-384, SHA-512, SHA3-224, SHA3-256, SHA3-384, SHA3-512, Tiger-192, Whirlpool, RIPEMD-128, RIPEMD-160, RIPEMD-256, RIPEMD-320, Skein256-224, Skein256-256, Skein512-224, Skein512-256, Skein512-384, Skein512-512, Skein1024-224, Skein1024-256, Skein1024-384, Skein1024-512, Skein1024-1024, MD2, MD4, MD5, Panama, Adler32, CRC32. Some cryptographic hash functions are available only in the premium version of VSTextHash (Windows, Mac OS). See additional information on www.lokibit.com to get premium version. On Linux all hash functions are available. VSTextHash is a native desktop application. This program was developed for Windows (Windows 10/8/7/Vista 32-bit and 64-bit, Windows XP is not supported), Mac OS, Linux (Ubuntu 64-bit). Local restriction applied over PDF file restricts users from editing, copying, printing, extracting data and doing other activities. Kernel for PDF restriction removal tool can be used to remove all such kinds of restrictions. PDF files are safe in usage because one can keep restrictions on editing, copying, printing, extracting data. It ensures the data safety when exchanged online or otherwise. This site does not contain serial number, crack, keygen VSTextHash serial number : serial number is the simplest type of crack. A serial number(cdkey,product key,etc) is register the program as you may already know. a crack or keygen may contain harmful software. If you cannot find the exact version you want, just give it a try. for more information read .nfo/.txt/.diz file include in zipped file.